On this and the next two Sundays we have parables of Jesus for our meditation so it would be good to remember the special characteristics of parabolic teaching. 1. Parables are wisdom teaching. By reading them we get a new insight into life – e.g. parenting, friendship, leadership, spiritual guidance, etc. 2. They teach by way of paradox. Things that we thought to be opposed turn out to be both true, and taken together reveal the new insight mentioned above. We must always be on the look out for a surprise in a parable therefore – an unexpected turn of events, something being praised that we would not normally consider praiseworthy. If we follow this up, the parable ends up challenging our values or the dominant values of our culture. 3. Parables are stories and we are invited to enter into their movement. At a certain point the story comes to a climax – the moment when we experience the surprise mentioned above. Note that the climactic moment will be different for different readers and for us at different times in our lives. The parable of the sower is one of Jesus’ greatest, not merely for its content, but as a masterpiece of imaginative teaching. The conclusion of the meditation is twofold – how deep! and, what a great teacher! – the parable interpreted in verses 18 to 23. We are free to remain with one section only or to see a thread running through the entire passage. In meditating on verses 4 to 9 we are free to take a different interpretation to that proposed in verses 18 to 23. Those verses focus on the different kinds of soil, and this is generally how the parable has been read in the Church. 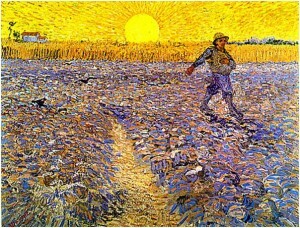 We can read the parable from the point of view of the sower, however, getting a feel of how free and generous of spirit he is – the fact that he is not overly concerned that some of the seed will not produce crop but continues to sow, trusting that eventually his work will bear abundant fruit. We celebrate sowers, God himself first of all, generous both in nature and in the work of grace. We also celebrate people like Jesus who praise the approach of the sower and reject their critics who advocate being calculating in relationships. 2. In verses 10 to 15, we take “parables” in the wide sense of events (in human behaviour or nature) which become lessons about life. The passage reminds us that it is the way of teaching preferred by God and by all good teachers – parents, community leaders, church ministers, spiritual guides. We ask ourselves, why? 3. Verses 16 and 17 celebrate the experience of parabolic teaching bearing fruit – the “Aha!” moment. We think of insights we take for granted today, whereas some years ago “sowers” were attacked for preaching them – equality of races and sexes, democracy, the Church’s option for the poor. 4. Verses 18 to 23 belong to a different context from verses 4 to 9. The Church has grown and become more settled. The question now arises, how come some remained faithful and others didn’t? The parable answers, “Look at the sower, you will see that it is the soil which determines whether seed bears fruit or not”. We repent of times when we allowed obstacles to prevent seed from bearing fruit in our individual lives and our communities. We also celebrate experiences of rich soil bearing abundant fruit. We are free to focus on the fact that even when the harvest is abundant there are still differences – “now a hundred fold, now thirty, now sixty.” What is the wisdom in being conscious of this? The parable of the sower is perfectly fulfilled in the lectio divina method. The biblical word is a seed sown in us; personal experience is the soil in which it takes root; we can identify various factors which prevent the word from “producing crop” ; once we “hear the word and understand it” (i.e. come to wisdom) it yields a rich harvest. The parable is also a powerful teaching on development. If aid from rich to poor countries is to “yield a rich harvest” it must be given as a seed which will take root in the local culture. Truly a call to repentance for those involved in globalization today – and we all are! – we even relate like that in our families, in our Church community, with our friends. – or that some fall on thorns and are choked by the thorns. and will produce their crop, some a hundred fold, some sixty, some thirty. – they sowed the seeds of care, good advice and their own example. on patches of rock, or among thorns. – that it was only for children, youths or older people. and so it does not produce the crop it was meant to produce in society. so that it may produce abundant crops. Lord, we look back on our journey to maturity. – that here was the kind of person we wanted to be with for the rest of our lives. and now we experience abundant peace within ourselves. and when it is time we will have more than enough. lest the little chance they may have be taken away. before they could be healed by you. – that all the baptized are fully members of the Church. but never saw it, to hear what we hear, but never heard it. Today our thoughts during this celebration are guided by the Parable of the Sower: seeds fell along the path, on rocks, among thorns, and into rich soil. Only the seeds which fell into the rich soil bore fruit. Christ is the sower, and while we desire to be good soil, we know there are times when we are pretty shallow like the depth of soil along the path. There are areas of rock in our lives where God’s word has not taken root, and there are areas where God’s word finds difficulty in taking root. So as we prepare to celebrate the mystery of Christ’s love, let us acknowledge our failures and ask the Lord for pardon and strength. 1. There is always a danger that the Eucharist is transformed from a celebration into an affair of words, words, and yet more words. Picture this situation: people have just sat down after listening to the (long) parable of the sower when they have heard the story (13:3-8), then teaching, then the explan­ation of the story (13:18-23); then they listen to the preacher explaining the story yet again, and possibly telling yet more stories ‘to bring the story home’ or else an explanation of ‘the mystery of the kingdom’ (alas, if it is that simple we should not refer to it as a mystery!). The result is information over­load: so many words that people become tired and hearing yet more words, they hear nothing. 2. An alternative would be something like this. Once people have settled in their seats, introduce a few moments reflec­tion with an introduction like this: We have heard the words of Jesus about the mystery of the kingdom and his words on how the word of God must bear rich fruit in our lives. Let us reflect in silence about what it means to us to have been called by Jesus to become mem­bers of the Father’s kingdom. 3. Conclude the period of reflections (you need only wait a minute or so after the coughing and clearing the throat phase has passed) with the invitation to stand for the profession of faith. The setting for the parable of the sower is informative. Matthew tells us that Jesus was sitting by the lakeside when ‘such crowds gathered round him’ (Mt 13:2) that he went to a boat and sat in it while the multitudes stood on the shore. We can readily imagine this scene, with great crowds of people hurrying to where Jesus was, anxious to listen to him teaching about God. Not many of us enjoy being pushed and crushed as tends to happen when there are crowds of people around us. So it tells us much about Jesus’ popularity — and the attractiveness of his teaching — that the people were willing to suffer the discomfort of being part of a large crowd simply to hear him speak. Many of them would feel another kind of discomfort, though, as Jesus’ parable unfolded. Familiar with the agricultural theme, they would have listened attentively to Jesus and at least some of them would have understood. Just as a farmer sows seed, some of which comes to fruition but much of which does not for various reasons, so the word of God goes unheeded by people who are negligent or wilful in their selfish refusal to nurture the seed of faith that is given to them by God. Jesus concluded the parable: ‘Listen, anyone who has ears!’ (Mt 13:9). In other words, those who truly seek God, those who want to understand, will hear God speaking to them through the parable. We tend to think of the parabolic method as being aimed at making it easier for the listeners to understand the things of God, without having to think too much about the story. But these words of Jesus require serious reflection, as does the disciples’ question to Jesus asking why he spoke to the crowd in parables. Jesus responded: ‘Because the mysteries of the kingdom of heaven are revealed to us, but they are not revealed to them’ (Mt 13:11). Thus we come full circle, back to the purpose of the parables, which is to teach — in a hidden way — the truths of the faith. In explaining the meaning of the parable of the sower, Jesus highlighted some important truths for us. For instance, he said: ‘When anyone hears the word of God without understanding it, the evil one comes and carries off what was sown in his heart: this is the man who received the seed on the edge of the path’ (Mt 13:19). There is a clear message here for parents, priests, teachers and anyone who is involved in passing on the faith. Neglecting to educate those in our care, or neglecting to nurture the seed of faith planted in their souls at baptism so that they cannot understand it to the best of their ability, is a grave failing and a serious sin. Similarly, the seed that fell on stony ground represents those who receive the faith with joy but buckle and fall away when trials come. Perhaps most of us fall into this category, by not living up to the demands of the Christian life because we are unwilling to suffer for Christ. Or perhaps we are like those who received the seed among thorns, that is, we allowed our faith to be choked because we preferred riches and the things of this world to following Christ. The gospel message is always the same and the parable of the sower embodies the entire message: we need to put God first in our lives. Nothing can be allowed to prevent us from doing God’s will. We strive to bring forth only good fruit in everything that we do and we do everything for the greater glory of God. A big point of this story is about the fruits – 30-, 60-, 100-fold. When we work at love or faith, the deeper things of life, some­thing good happens. We try to hand on faith in the family and school situations. Sometimes we feel we see little return for our work. Or we give time to the family in many ways and see little return for our love. The consoling point of the story – we never know when or where there will be the fruits of our love … Love given is never lost. Like dropping something into the river, you never know where it will end up. Love given to children in the family may bear fruit in the next generation. We never know. Good may be done in a son’s or daughter’s new country from the seeds of faith planted at home. Part of life is trial and effort. Jesus’ attitude was the same. He ‘threw’ out love like the sower throws out the seed. He knows it may fall on hard ground, but he gives it anyway. He gave love on Calvary to everyone. God is like that. It may take years to flower. God doesn’t stint the seed, nor does he stint love. A woman in a red car pulls up to the toll booth at the San Francisco Oakland Bay Bridge. “I’m paying for myself and the six cars behind me,” she says with a smile. One after another, the next six drivers arrive at the booth, money in hand. “Some lady up ahead already paid your fare,” says the collector. “Have a nice day.” The woman, it turned out, had read a note taped to a friend’s refrigerator: “Practice Random Kindness”. Judy Freeman spotted the same phrase on a warehouse wall, 75 miles from her home in San Francisco. When she couldn’t get it out of her mind, she finally drove all the way back to copy it exactly. A few days ago I heard from a friend in Marin County, California. She had jotted the phrase down on a restaurant place mat after mulling it over for days. “Here’s the idea,” she says. “If you think there should be more of something, do it – randomly. Kindness can build on itself as much as violence can.” A passer-by may plunk a coin into a stranger’s meter just in time. A group of people with pails and mops may descend on a run-down house and clean it from top to bottom while the elderly owners look on, amazed. A teenager shoveling snow may be hit by the impulse and shovel his neighbor’s driveway too. Senseless acts of beauty spread. A man plants daffodils along a roadway. A concerned citizen roams the streets collecting litter in a supermarket cart. A student scrubs graffiti from a park bench. It’s a positive anarchy, a gentle disorder, a sweet disturbance. And you can’t be a recipient without feeling a pleasant jolt. If you were one of those commuters whose toll was paid, who knows what you might have been inspired to do for someone else? Like all revolutions, guerrilla goodness begins slowly, with a single act. Let it be yours. 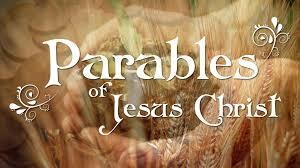 In this Sunday’s gospel Jesus speaks of many things in parables. 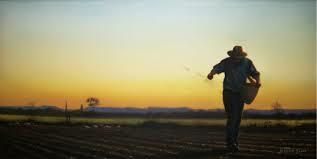 One of his parables spoke of the Sower who went out to sow seeds. It appears to be a simple parable full of meaning, which can be applied to our lives. 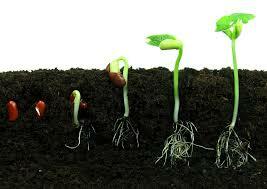 There is an abundance of seed sown which falls on different types of soil. Some seed fall on the path and are eaten up; others fall on rocky soil and their growth is stifled and choked. Their growth is hampered because they had no depth and withered away. But there are some seeds that fall on good soil and bring forth grain, some hundredfold, some sixty, some thirty. Jesus adds, “Let anyone who has ears listen.” When asked by his disciples Jesus reveals the deeper meaning of the parable. When we meditate on His word the deeper truth and insights reveal themselves to us. Often we claim all credit for the effort we have put in, forgetting that without the seed our efforts would be in vain. The seed may look small and our effort might look humongous but without the seed of God’s blessing and power we strive in vain. On the other hand, without our effort God will not do anything in our lives. He needs our co-operation and sustained efforts to produce fruit in plenty. We have been given a wonderful vocation, to be co-creators with God, to multiply the fruits of the earth and sustain creation for ourselves and others. We are the privileged ones! “To you it has been given to know the secrets of the kingdom of heaven, but to them it has not been given. For to those who have more will be given, and they will have an abundance; but for those who have nothing, even what they have will be taken away.” “But blessed are your eyes, for they see, and your ears for they hear. Truly I tell you, many Prophets and righteous people longed to see what you see, but did not see it, and to hear what you hear but did not hear it.” We need to constantly thank God for giving us the privilege to see his works and hear his word though we are unworthy of his blessing! Consider this: From failure to success*Woody Allen –Academy-Award-Winning writer, producer and director-flunked motion picture production at New York University and the City College of New York. He also failed English at New York University. *Leon Uris, author of the bestseller Exodus, failed high school English three times. *In 1959, an Universal Pictures executive dismissed Clint Eastwood and Burt Reynolds at the same meeting with the following statements. To Bert Reynolds: “You have no talent.” To Clint Eastwood: “You have a chip on your tooth, your Adam’s apple sticks out too far and you talk too slow.” As you no doubt know Bert Reynolds and Clint Eastwood went on to become big stars in the movie industry. When she looked ahead Florence Chadwick saw nothing but a solid wall of fog. Her body was numb. She had been swimming for nearly sixteen hours. On that 4th of July 1952, the sea was like an ice bath and the fog was so dense she could hardly see her support boats. Against the frigid grip of the sea, she struggled on – hour after hour- while millions watched on national television. Alongside Florence in one of the boats, her mother and trainer offered encouragement. They told her it wasn’t much farther. But all she could see was fog. They urged her not to quit. She never had ……until then. With only a half mile to go, she asked to be pulled out. Still thawing her chilled body several hours later, she told a reporter, “Look, I’m not excusing myself, but if I could have seen land I might have made it.” It was not fatigue or even the cold water that defeated her. It was the fog. She was unable to see her goal. Two months later, she tried again. This time despite the same dense fog, she swam with her faith intact and her goal clearly pictured in her mind. She knew that somewhere beyond that fog was land and this time she made it! Florence Chadwick became the first woman to swim the Catalina Channel, eclipsing the men’s record by two hours! 1) Think of John Harvard here. In 1637, he came to the American colonies from England. He was a promising scholar. The New World appeared to be his oyster. But the poor fellow upped and died after but one year. His will gave $3500 and 200 books to a fledgling university. The school became Harvard University. Today it staffs a faculty of 1000 and has a student body of 20,000. It enjoys an international reputation. (Barclay). Bequeath to your posterity …..
2) The story is the story of the fussy vegetarian. A young women was committed to being a vegetarian, but she was never satisfied with any of the fruit or vegetables she bought. For her, all melons were too ripe, or not ripe enough. In her eyes, she could never find tomatoes that weren’t bruised. Heads of cauliflower and broccoli were too big or too little. She was never happy. 3) Fr Murphy in the restaurant: TRY FAITH and $20 bill. "FAITH" came in first in the fourth race at the track yesterday, and she paid 30 to 1. 3) The image of the Word of God as a seed is beautiful. A seed is something small, almost insignificant, but inside it has an enormous power. In the last century we saw the power of a seed. Some of us remember the sixties, when scientists were predicting massive worldwide famine. They said that the famine would hit countries like India worse. India's population had grown to 440 million and the experts agreed that its land could not feed so many people. They concluded that the only thing the world could do was to let India's surplus population starve. There was, however, one man who saw things differently. His name was Norman Borlaug (Nobel Prize in 1970). He went to India not with a shipload of food but with a seed called "Sonora 64." Now, you can't blame people for being a little sceptical. Here was an American agronomist with a wheat seed developed in Mexico. But Borlaug convinced the authorities to give it a try. They planted some Sonora 64 wheat in the Punjab region of India. The results were spectacular and pretty soon they were using it throughout the subcontinent. Later, they introduced a new variety of rice, called IR8, and it brought even better results: Formerly a hectare (an area of 100 meters by 100 meters) could produce about a ton of rice. With IR8 seed, a hectare - without fertilizer - yielded five tons of rice and, under optimum conditions, ten tons. Thus IR8 seed brought about a ten-fold increase in the rice harvest. These new seeds enabled India and other countries to avert famine. Today with over a billion people, India actually produces a food surplus. ** Here we see the power of a seed. We are to understand, of course, that the sower is God, the seed is the Kingdom, and the various types of soil represent us--you and me. On the surface of it, of course, it doesn't sound as though God is a very frugal farmer. After all, most of the seed that is strewn about never takes root. But this is not really a story about the sower or the seed. It is a story about different types of soil, or to put it another way, the responses of different types of people to the Kingdom. The question is really, what is the state of our hearts when the seeds are sown with us? With that in mind, let us examine the various conditions of the heart mentioned in this story. open grave swept his hand to a salute that might have been given to a king. The friend walked away with this soldier, and as they walked, the wind blew the soldier's raincoat open to reveal the shoulder badges of a brigadier general. The general said, "You will perhaps be wondering what I am doing here. Years ago Thomas was my Sunday School teacher; I was a wild lad and a sore trial to him. He never knew what he did for me, but I owe everything I am or will be to old Thomas, and today I had to come to salute him at the end." Thomas did not know what he was doing. No preacher or teacher ever does. Keep sowing the seed. We can leave the rest to God, including keeping the fire going. And that is GOOD news for all us tenant farmers. Even the dullest gardener among us does not expect every single seed he sows to come up singing roses. He knows the wind will blow some seeds away. The squirrels will grow fat on others. However, even the amateur gardener keeps on sowing. And he certainly does not give up expectations of a generous growth of flowers. What can makes us ineffective or unresponsive to God's word? Preoccupation with other things can distract us from what is truly important and worthwhile. And letting our hearts and minds be consumed with material things can easily weigh us down and draw us away from the heavenly treasure that lasts for eternity. God's word can only take root in a receptive heart which is docile and ready to hear what God has to say. 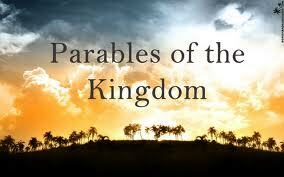 The Kingdom of God was the main emphasis of Jesus' ministry and this is accepted by most. But defining precisely what the Kingdom was is a bit more difficult. Indeed, even Jesus himself was often illusive about it. He did not speak in absolutes; rather, he spoke in parables. Such is our scripture text for this morning. 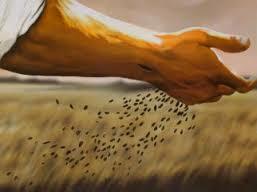 Jesus compared the Kingdom to a sower going out and spreading seed. Some of it falls upon hard ground and is unable to take root. Some of it falls on shallow ground, and although it initially sprouts it later withers away. But some seed falls upon good earth and comes to fruition and produces a harvest. Neither "fish nor fowl." "Lukewarm." "Wishy-washy." "Spineless." "Mediocre." These are not good character references. These are descriptions of people who have no personal convictions, no compelling passions, no "take-it-to-the-front-line" faithfulness. Instead, like liquid gelatin, those who have no backbone pour themselves into whatever mold is put before to them for the simplest, easiest gain. The apostle Paul was definitely not a "lukewarm" or "wishy-washy" kind of guy. In fact, he warned the church at Rome "Do not let the world squeeze you into its mold" (Romans 12:2, Phillips translation). 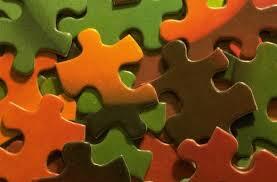 Of course, the church can "squeeze" you into a mold of its own making just as firmly as the world. The mold of Christ is the only mold that should gain entrance to the human heart. When Paul stood against the new religious movement forming around this guy named "Jesus the Christ," he was a "homeland defense" zealot. In his role as a protector of the establishment faith of Temple religion, Paul never hesitated to seek out and hunt down any and all who may have been open to the message of this so-called "Christ." As a protector of the tradition, Paul was vigilant and virulent. In the case of Stephen, historically the first "Christian" martyr who was stoned by a mob, Paul was even deadly. The Wrong Question: What Does It Mean? For a moment, let's put this story to one side and hear another story. It concerns a young anthropologist named Connie who works among aboriginal people in Australia. The community where she lives has a rich tradition of storytelling. Everyone gathers at night, a story is told, and then another, and another. Connie feels extraordinarily privileged when she is asked to join in this activity. The first story told that evening is about the animal ancestor of this community and its adventures at the beginning of time. The story overflows with detail, action, imagery. At the end of the story, Connie is delighted. "May I ask a question?" she says. "What does it mean?" All eyes are upon her. The elder looks at her gravely and says, "That is the one question you cannot ask." A long time passes before she is invited again. She has asked the wrong question. "What does it mean?" was the wrong question for Connie to ask about the aboriginal myth. It may also be the wrong question for us to ask about the story of the sower, or any of the stories told by Jesus. "What does it mean?" is the wrong question if we think that by having an answer, we can somehow get a handle on this story, domesticate it, make it safe. The stories Jesus tells are not subject to our control. He tells these stories so that we can be transformed. He tells these stories, not so that we can ask questions about them, but so that the stories can ask questions of us. Charles Hoffacker, What Kind of Soil Are You, What Kind of Sower? Mother Teresa of Calcutta, India died as a world-known figure. But who would have ever thought she would have attained such influence when she first began? What did she have to recommend her? A tiny woman, she began with the most meager of resources. Mother Teresa told her superiors, "I have three pennies and a dream from God to build an orphanage." "Mother Teresa," her superiors said, "you can't build an orphanage with three pennies . . . with three pennies you can't do anything." "I know," she said, smiling, "but with God and three pennies I can do anything." Mother Teresa understood the principle of the seed. It takes very little -- but very little blessed by God -- and miracles can occur. This, of course is akin to Jesus' teaching elsewhere, that faith only the size of a mustard seed can produce an enormous bush (Matthew 17:20). That is a constant law in God's world. One of William Barclay's friends tells this story. In the church where he worshiped there was a lonely old man, old Thomas. He had outlived all his friends and hardly anyone knew him. When Thomas died, this friend had the feeling that there would be no one to go to the funeral so he decided to go, so that there might be someone to follow the old man to his last resting-place. There was no one else, and it was a miserable wet day. The funeral reached the cemetery, and at the gate there was a soldier waiting. An officer, but on his raincoat there were no rank badges. He came to the grave side for the ceremony, then when it was over, he stepped forward and before the open grave swept his hand to a salute that might have been given to a king. The friend walked away with this soldier, and as they walked, the wind blew the soldier's raincoat open to reveal the shoulder badges of a brigadier general. Doug Murren, in Churches That Heal (1999), retells that old Native American tale of an opossum watching a seed grow. One day an opossum visited his good friend, a raccoon, at his home near the river. The opossum marveled at his friend's lush garden and asked if he could grow one like it. The raccoon assured the opossum he could do so, although he cautioned him, "It is hard work." Furious with anger and frustration, the opossum shouted at his buried seeds, "Grow, seeds, grow!" He pounded the ground and stomped his feet. But nothing happened. Soon a large crowd of forest animals gathered to see who was making all the commotion and why. The raccoon came to investigate with all the others. "What are you doing, Opossum?" he asked. "Your racket has awakened the whole forest." The opossum railed about having no garden, then turned to each seed, and commanded it to grow. When the animals began to mock the opossum for his silly actions, he only screamed louder. At last the raccoon spoke up once more. "Wait a minute, Possum," he said. "You can't make the seeds grow. You can only make sure they get sun and water, then watch them do their work. The life is in the seed, not in you." Then one glorious morning the opossum wandered outside to see that multitudes of beautiful green sprouts dotted his garden. Just a few days later, gorgeous flowers began to bloom. With uncontrollable excitement and pride, the opossum ran to his friend, the raccoon, and asked him to witness the miracle. The raccoon took one long look at the thriving garden and said, "You see, Opossum, all you had to do was let the seeds do the work while you watched." "Yes," smiled the opossum, finally remembering the wise words of his friend many days before, "but it's a hard job watching a seed work." There is a story about an old man who always had witty and wise answers for people who asked him anything. Once, a smart-alecky came to him with his hands covering something he was holding. He told the sage that he had a small, newly hatched bird in his hands. He challenged the old man to tell him whether the bird was alive or dead. He, of course, planned to prove the old man wrong, because if he said the bird was dead, he would simply open his hands to expose a perfectly healthy baby bird. But if he said the bird was alive, then he would crush the bird before opening his hands. The old man proved wiser than he thought, because he said, "The bird is whatever you choose him to be." And that's the way it is with the kingdom of God. The choice for the kingdom to live or die is within your grasp. What do you chose? Fred Craddock tells a story about the time he got a phone call from a woman whose father had died. She had been a teenager in one of the churches he had served as pastor twenty years before, and he would have sworn that if there was ever a person who never heard a word he said, that teenage girl was it. She was always giggling with her friends in the balcony, passing notes to boys, drawing pictures on the bulletin. But when her father died, she looked up her old pastor, the Rev. Fred Craddock, and gave him a call. "I don't know if you remember me," she started. Oh, yes, he remembered. "When my daddy died, I thought I was going to come apart," she continued. "I cried and cried and cried. I didn't know what to do. But then I remembered something you said in one of your sermons . . ." And Fred Craddock was stunned. She had remembered something he had said in one of his sermons?! It was proof enough to him that you can never tell how the seed will fall or where it might take root. This past week I visited an old friend dying of cancer. The hospice nurse said he had 3-5 days to live. I went to remind him of all the things he had taught me in life as an artist. Once I viewed one of his works and I said, "Tell me what that means." He said, "If I tell you, that's all you will ever see there." I never forgot this truth and have employed it in zillions of ways over the years. What struck me as a tight-fisted approach on his part, at first, actually became an extravagant gesture of grace, because it has encouraged a "good soil" part of me to look creatively at art, literature, music, people, ideas, etc., in open and receptive ways. There is now a part of me that regularly asks what may be seeking me there, calling me to understand, to respond. Good soil is that part of us that seeks to let God do his thing with us - affirm us and stimulate us to produce the kind of caring and generous spirits which only a prodigiously extravagant God, a God almost wasteful with his grace, can produce. Four brothers left home for college and became successful doctors and lawyers. Some years later, they had a reunion. They chatted after having dinner together. They discussed the gifts they were able to give their elderly mother who lived in a far away city and decided to open their mother’s thank you letter to each. The first said, "I had a big house built for Mama." The second said, "I had a hundred thousand dollar theater built in the house." The third said, "I had a Mercedes dealer deliver an SL600 to her." The fourth said, "You know how Mama loved reading the Bible, and you know she can't read anymore because she can't see very well." "Well I met a preacher who told me about a parrot that can recite the entire Bible. It took twenty preachers 12 years to teach him. I had to pledge to contribute $100,000 to the church, but it was worth it. Mama just has to name the chapter and verse and the parrot will recite it." The other brothers were impressed. go, so that there might be someone to follow the old man to his last resting-place. There was no one else, and it was a miserable wet day. The funeral reached the cemetery, and at the gate there was a soldier waiting, an officer, but on his raincoat there were no rank badges. He came to the graveside for the religious ceremony. When the pastor finished his prayers, the officer stepped forward and gave a solemn military salute to Thomas in the closed coffin as if to a dead king. The friend walked away with this soldier, and as they walked, the wind blew the soldier's raincoat open to reveal the shoulder badges of a brigadier general. The general said, "You will perhaps be wondering what I am doing here. Years ago Thomas was my Sunday school teacher. I was a wild lad and a sore trial to him. He never knew what he did for me, but I owe everything I am or will be to old Thomas, and today I had to come to salute him at the end." Thomas did not know what he was doing. No preacher or teacher ever does. Keep sowing the high-yielding seeds of the word of God. This is the GOOD news of today’s gospel for all of us, tenant farmers. 5. How about living for God by becoming a sower of the word of God? On June 1, 2001, a young Arab man named Saeed Hotari strapped a load of explosives to his body and walked into downtown Tel Aviv. He waited until he was surrounded by a crowd of Israeli citizens, and then Hotari triggered the bombs. Twenty-one Israelis died along with Hotari in the blast. As soon as the news reached Saeed Hotari's community, his family and friends began celebrating. To them, he is a hero. The Palestinians who commit these bombings, and those who celebrate them, believe that a jihad, an act of holy war, is the highest form of religious service. And anyone who dies in a jihad is guaranteed to go straight to Paradise. The Hamas, the militant Palestinian group that is behind these bombings, believes in educating young children in the glories of jihad. There are signs along the walls in Hamas-run schools extolling the heroism of suicide bombings. Saeed Hotari's proud father remarks that he hopes Saeed's brothers and friends follow his example and become suicide bombers, too. As he says, "There is no better way to show God you love him." That's scary. It's misguided of course, even demonic, but it's also a level of commitment that most of us don't know anything about. There IS a better way to show God you love Him. Rather than dying and killing other people for Him, how about living for Him? How about becoming a sower of seed? You don't have to be someone special to sow seeds of the kingdom, but you do need to be committed. You do have to know what you believe and you have to give yourself completely to that belief. That is what today’s gospel challenges us to do. Gordon Giesbrecht is the director of the Laboratory for Exercise and Environmental Medicine at the University of Manitoba. His nickname is Professor Popsicle. This is not a sign of disrespect. Professor Giesbrecht has spent his career studying the effects of extreme cold on the human body. He quite literally immerses himself in his subject. Throughout the course of his career, Professor Giesbrecht has induced hypothermia--extremely low body temperatures--on himself thirty - seven times. He regularly exposes himself to freezing temperatures and records the effect those temperatures have on his physical and mental health. His research has led to life-saving advances in treating victims of exposure and hypothermia. ("Dr. Cool" by Alisa Smith, originally published in Outside Magazine, reprinted in Reader's Digest, February 2005, pp. 109-111.) We do not know if Dr. Giesbrecht is more brilliant than other scientists. But we do know he has a high degree of commitment. We know that God was committed to saving humanity from its own foolish ways. How do we know? Because of the cross. You and I want to go through life on the cheap. We want to get by on minimal effort. And it simply will not work. So, ask yourself what kind of seed are you sowing in the lives of those you love? In the community? In the world for which Christ died? Will this be a better world because you've been here? It doesn't take a lot of talent to make a difference in the world. All it takes is someone willing to take up a cross. Dr. Keith Wagner, of St. Paul's United Church of Christ in Sidney, Ohio tells the story of a small boy in Florida some years ago. It seems he heard that the Russians were our enemies. He began to wonder about the Russian children, finding it hard to believe that they were his enemies. He wrote a short note: "Dear comrade in Russia. I am seven years old and I believe that we can live in peace. I want to be your friend, not your enemy. Will you become my friend and write to me?" He closed the letter, "Love and Peace" and signed his name. He then neatly folded the note, put it into an empty bottle, and threw it into an inland lake near his home. Several days later, the bottle and note were retrieved on a nearby beach. A story about the note appeared in a local newspaper and the media picked it up nationwide. A group of people from New Hampshire who were taking children to the Soviet Union as ambassadors of peace, read the article, contacted the boy and his family. They invited them to accompany the group to Russia. So, the little boy and his father traveled to Russia as peacemakers. One little boy made a difference. He planted his seed and it bore much fruit. In 1998, sixteen-year-old Alden Tucker read a news story about Michael Pe, a fifteen-year-old boy of multiracial heritage who had contracted leukemia. Michael's only hope for recovery was a bone-marrow transplant; unfortunately, his exotic ethnic heritage--African-American, Hispanic, and Korean--drastically reduced his chances of finding a matching donor. Alden Tucker, who is also of the same ethnic mix as Michael, immediately volunteered to serve as a donor. Because bone marrow donation is an invasive and painful procedure, federal law prohibits bone-marrow testing for people under eighteen years of age. Alden Tucker wasn't about to take "no" for an answer. He began talking to reporters and legislators about changing the consent laws for bone- marrow donation. He also met and befriended Michael Pe. Just before Michael's death in 1999, Alden promised him that he would never give up the campaign to change bone-marrow donation laws. In March 2000, the Michael Pe Law allowing bone-marrow testing and donation by people under the age of eighteen was signed into law in the state of Washington. (Rebecca Cook in Teen People, cited in "Everyday Heroes," Reader's Digest, Nov. 2001.) He was only a teenager but Alden Tucker made a difference. So can you and I if we are willing to pay the price by sowing the seeds of the gospel with a high level of commitment. Pastors and people worry about shrinking church membership. At times this worry is expressed by criticism aimed in one direction or another. "If only our pastor preached the gospel," a church member said recently, "then our church would be filled to overflowing every Sunday." "If only my people would live out their faith," a pastor said recently, "then our congregation would grow." "If only our bishops would develop some effective guidelines for evangelism," both pastors and people say on occasion, "then we wouldn't have to face another year with fewer members." Both worry and criticism of this kind grow out of a concern for the coming of God's kingdom. We long for the promised harvest. At times, however, what we may be doing by such worry and criticism is trying to force God's hand. We may find ourselves not only impatient for the harvest, but also impatient with having to live by His promise alone. We want more and more visible assurance of the harvest's coming. And so we look for people or for programs to make it happen. Certainly there is nothing wrong with pastors preaching the gospel, or with lay people living out their faith, or with denominations issuing effective guidelines for evangelism. It certainly may be wrong, however, to connect such activity with guaranteed growth. Pastors, people, and denominations may do everything "right," and growth may still not occur. That is no reason for not doing things "right," but it is a reason for optimism beyond any visible success. The harvest is God's, and you and I should be cut free from ever thinking that it is ours. During World War II, the city of Palermo, Sicily, a military objective of the Allied Powers, was to be bombed by the American Air Force. To warn the Sicilians, telling them to flee, thousands of pamphlets were dropped on the city beforehand, but the citizens simply did not believe the warning. They listened, but they did not hear! When the American planes came and dropped their bombs, hundreds of Sicilians were killed; in fact, in some cold, dead hands were found the very pages urging them to leave the city. Listening without hearing is also what Jesus refers to in the Parable of the Soils which was spoken at a high point in his career - when people were flocking to him in great numbers. "other seed fell among thorns, which grew up and choked the plants." we all know that sometimes the message of Christ does not get through because of the person entrusted with conveying it. The most famous example of that, of course, was Mahatma Gandhi. In his autobiography Gandhi tells that during his early days in South Africa he inquired into Christianity. He attended a certain church in Pretoria for several Sundays, but, he writes, “The congregation did not strike [him] as being particularly religious; they were not an assembly of devout souls, but appeared rather to be worldly-minded people going to church for recreation and in conformity to custom.” He therefore concluded that there was nothing in Christianity which he did not already possess. Gandhi was driven away from Christianity by the fact that the performance of Christians he met fell far short of their profession of faith. (G. T. Bellhouse, The Hand of Glory, pp. 7, 8). 13. Life is filled with choices between grains and weeds. There is an old Native American tale about a chief who was telling a group of young braves about the struggle within. "It's like two dogs fighting," said the chief. "One dog wants to do right. The other dog wants to do wrong. They growl at each other all the time." "Which is going to win?" inquired a young brave. "The one you feed," replied the chief. Verse 8 says, "Still other seed fell on good soil where it produced a crop, a hundred, sixty, or thirty times what was sown." 14. “Some seeds fell on ‘good soil’"
The Tennessee Valley Authority started building its many dams on the Tennessee River in 1930s. To do that, they had to relocate a number of people who were living in the area that would be flooded when the dams were finished. One family in particular lived in an old, ramshackle cabin. The TVA built them a beautiful split-level ranch home on the hill overlooking the location of their former home. But when the Authority came to help the family move, they refused to go. The engineers tried to reason with them and, when that did not work, they called the project manager in. He failed, too. Finally, the TVA brought in a social worker. She asked the family to tell her the reason they did not want to move. The father of the clan pointed to the fireplace and said, "You see that fire in there? My grandpa built that fire 100 years ago when no one in these parts had matches. So he made the family promise to never let it go out. He tended it as long as he could and then my father took over and kept it going while he was alive. And, now that it's my responsibility, I am not about to let it go out." That gave the social worker an idea. She asked the family if it would be all right if the TVA brought in a coal bin and transported the burning coals from the cabin to the new house up on the hill. That way, they would have the same fire in their new home. The family huddled together to discuss the suggestion and decided that would be acceptable. And so that family was moved out of the way before the river came and covered their old cabin. Have you ever felt that it was absolutely and utterly up to you, against all opposition, to keep the fire going (no matter what "the fire" might be)? If you have, you are certainly not alone. The situation being addressed in this morning's gospel parable is along that line. Matthew's gospel was compiled and distributed probably some fifty years after Christ's earthly ministry (around 85 AD). The early church had expanded beyond Jerusalem through the missionary efforts of Paul and others but was still rather minuscule in terms of numbers and influence. There was opposition and even some persecution at the hands of political and religious establishments. It was a time when discouragement could have easily overcome that small band of believers. Hence, Mathew included the parables of chapter 13 in his gospel ("earthly stories with heavenly meanings"), perhaps to motivate and encourage the preaching and practice of the good news in the face of opposition. (David E. Leininger). The Reverend Jerry Anderson, a retired pastor in Tennessee, was an avid duck hunter as a young man. Every fall when the first cold front moved in from the north, he would take out his duck decoys, clean them up and put new anchors on them. When duck season opened, he was ready. He and his dad usually hunted mallards. Now, mallards are puddle ducks, according to Reverend Anderson. They paddle around in shallow water and feed on the marsh grasses growing there. They eat only what they can reach from the surface. Occasionally, though, he and his dad would see a redhead or canvasback slipping into their decoys. These are diving ducks. They dive to great depths to feed on plants growing on the bottom of the lake. Now in some ways Anderson says, Christians are like those ducks. Some are puddle ducks, satisfied with the nourishment they find in the shallows of the Christian life. Others are divers. They plunge deeply into the Word through study, reflection, and participation in the life and ministry of their church. According to the parable of the sower the word yields a rich return in their lives.